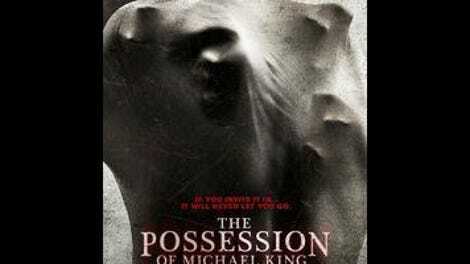 In the opening minutes of The Possession Of Michael King, the titular character claims that his New Year’s resolution is to make a documentary about his wonderful family. This is a sure sign that a) he’s a pretty terrible documentarian, and b) something awful is about to happen to said family (apart from the terrible movie he plans to make). Sure enough, his wife dies offscreen moments later, leaving Michael (Shane Johnson) in charge of his young daughter Ellie (Ella Anderson), and in bitter pursuit of a new documentary that will attempt to disprove the existence of God or the afterlife by debunking various people who believe in it. The faux-doc angle makes The Possession Of Michael King a kind of found-footage movie, but by purporting to be a documentary-in-progress, it offers a variation that is increasingly popular with unimaginative filmmakers: the found-and-half-edited-footage horror movie. It doesn’t make much logical sense, implying that the filmmaker is either editing his freaky material as he goes, or that a third party found the recordings and made some edits, but left in lots of home-movie bits and jarring cuts. But with the proliferation of found-footage horrors, the pseudo-documentary style at least gives this one some shape, and a reason for opening up beyond a few simple locations. As such, when Michael first starts talking to believers—like a man who claims he prayed to God with no response, and got better results praying to the Devil—the movie hints at an anthology of side characters that are more interesting than the typical horror-movie family. Michael settles on a guess-and-check method of supernatural investigation, trying out various methods of demon-summoning (often involving ingestion of psychedelic drugs); these scenes have dashes of mordant humor and a developing through-line that’s mildly creepy, if not especially scary. But after an efficient start, The Possession Of Michael King drags, weighing itself down with genre conventions the filmmakers don’t seem to understand or care about. Often the movie cuts to surveillance-angle shots—not because it has established the existence of surveillance cameras in Michael’s house, but because this is something that found-footage movies do when they need to shoot wide. Eventually this fudging expands to include handheld shots (complete with digital noise) coming from nonexistent cameras held by no one, with Michael still referring to “footage” being captured. It’s more of an imitative approach than a thought-out one; director David Jung cribs imagery from the Paranormal Activity series as well as The Blair Witch Project. These steals are actually some of the film’s more distinctive visual moments; much of the rest features the same scrambled-camera, garbled-audio effects, and dead animals seen in so many other horror movies. Those ghosts of other movies start howling every time King offers up an interesting idea (communicating with the same spirit across different, dangerous methods) or image (creepy first-person shots of demonic behavior). The film goes through these motions—and nails the occasional strong scare—all in service of a story that’s supposed to be about an individual’s battle against faith (metaphorical and literal demons, etc.). But Jung stacks the deck with a dismissive, condescending nonbeliever out of a low-rent religious picture, giving Johnson little to work with beyond predictable mania. In movies like this, disbelieving and fighting demonic possession seem equally pointless. It’s starting to feel that way about watching them, too.